Thanks to everyone who got their NECA 2009 Seattle registrations in before early registration closed on July 24. All those last-minute decisions pushed our attendance well beyond expectations! Registration is still open, and anyone can register on-site in Seattle as well. To add a pre-convention workshop, go here. Something to consider when making hotel reservations for NECA 2009 Seattle — Sheraton hotels now offer many green advantages! Save on hotel reservations before July 24! more details and to register for NECA 2009 Seattle visit www.necaconvention.org. Look forward to seeing you in Seattle, WA September 12-15, 2009! NECA is no longer offering the whale watching tour through clipper as previously announced. If you are interested in participating in a whale watching tour, contact The Prince of Whales, toll free at 1-888-383-4884. Guests may also purchase tickets by calling 1.800.888.2535 or online at clippervacations.com. You will need to reference the original Group Booking Code, #8120167, to purchase tickets. 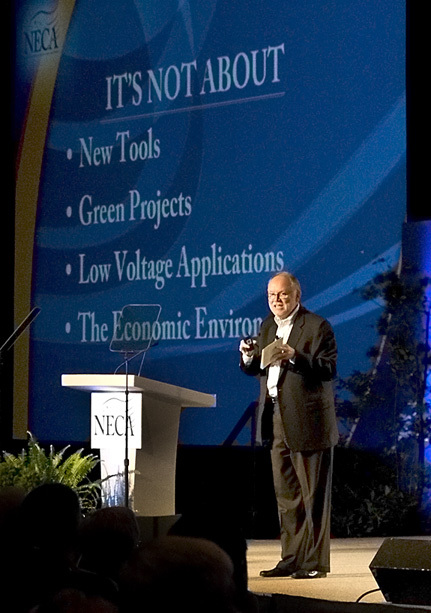 Time is Running Out, Your Opportunity for Affordable Training is at NECA 2009 Seattle! There’s a great reason to arrive early for NECA 2009 Seattle – and to bring your key employees with you. A dozen different Pre-Convention Workshops will be held on Friday and Saturday, September 11-12, at the Washington State Convention & Trade Center. They’ll feature expert instructors on topics ranging from succeeding in new markets and making the most of new technology to improving productivity and safety performance and coping in these trying times. They are open to all electrical industry participants. Nowhere else can you find so many in-depth learning opportunities at such affordable prices, all in one location. (Workshop fees are as low as $75, and none exceeds $250.) Registration for any Pre-Convention Workshop includes admission to all three days of the NECA Show, any of the Technical Workshops held in conjunction with the Show, and the New & Featured Product Room– all at no additional cost! Use the online registration form for NECA 2009 Seattle to reserve your place at the Pre-Convention Workshop(s) of your choice. Check out your Pre-Convention Workshop Options and register NOW!